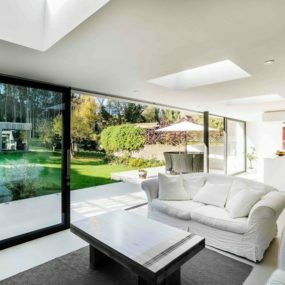 Contemporary extensions are a quick and easy way to enhance your living space without moving or dealing with property sale and purchase. All you have to do is hire professionals and communicate your needs. 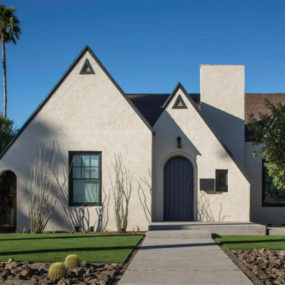 While the extensions may add a lot more space and functions to the house, even the most classic homes may also benefit from the contrast in architecture aesthetic-wise. 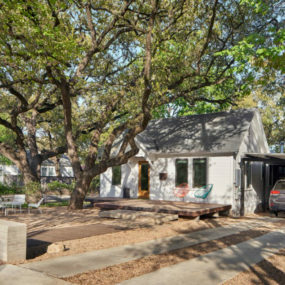 See how modern homeowners and their architects go about solving the problems of space without tearing down or completely reconstructing their homes. 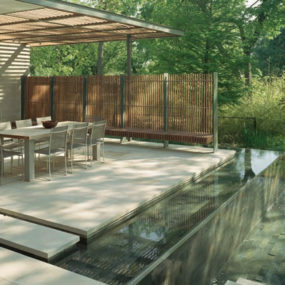 This private home in Austin needed space for large social gatherings and owners’ collections of art. 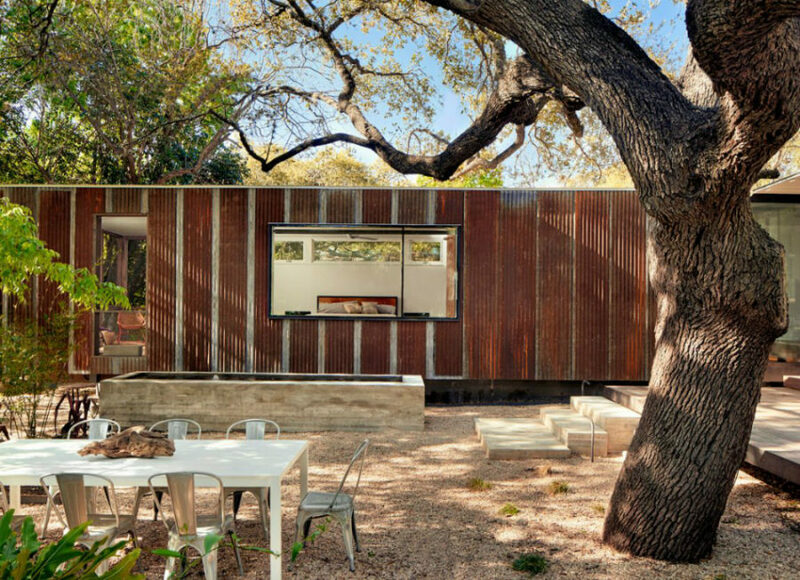 Nick Deaver Architect added an extension with the looks of a rusted shipping container and a glazed room for dining. 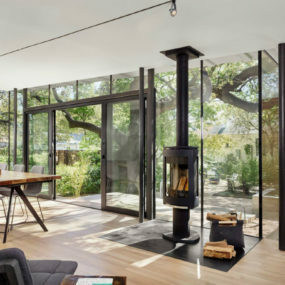 In the yard with the two oak trees, they built a large terrace that seamlessly connects to the glass dining room, although there is a separate dining table standing outdoors. 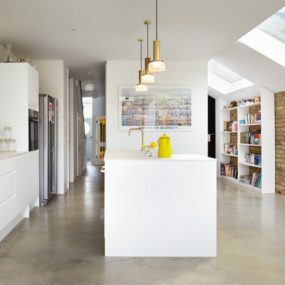 Inside the extension is as modern as it gets with white wood floors and contemporary furnishings. 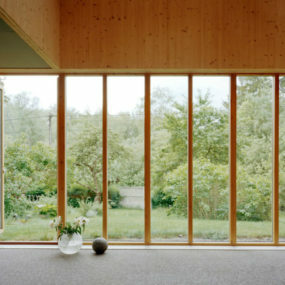 A whiff of modernist flair still lurks in the corners of the house, however. 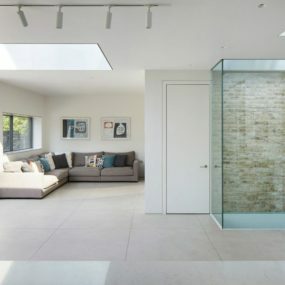 architecture studio added a modern extension to the 1930’s house to create two additional open rooms, one of which is almost a fully glazed bedroom. 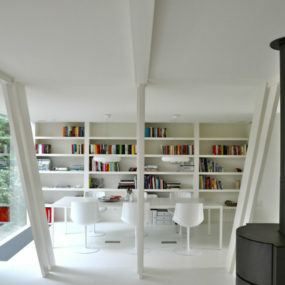 Set together, one of the rooms extends further than the other. 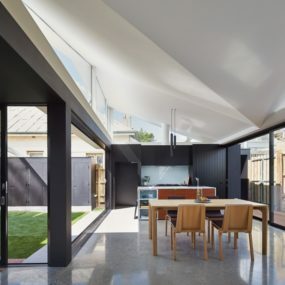 The walls of the dining room extension also protrude to create a covered patio. 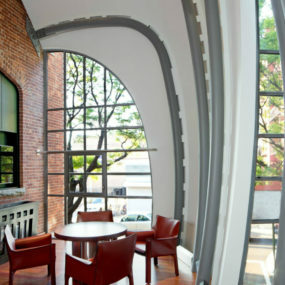 Although the extensions are very sleek, they were purposefully designed to go well with the original architecture. 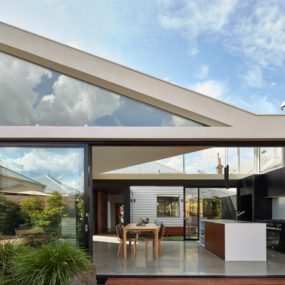 The house’s pitched roof comes as the main element in both the main structure and additions. 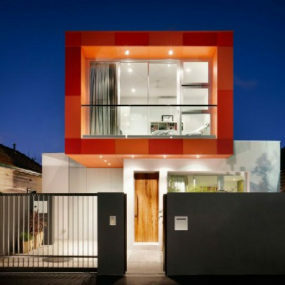 This creates a mild contrast, and makes the extensions complement the building. 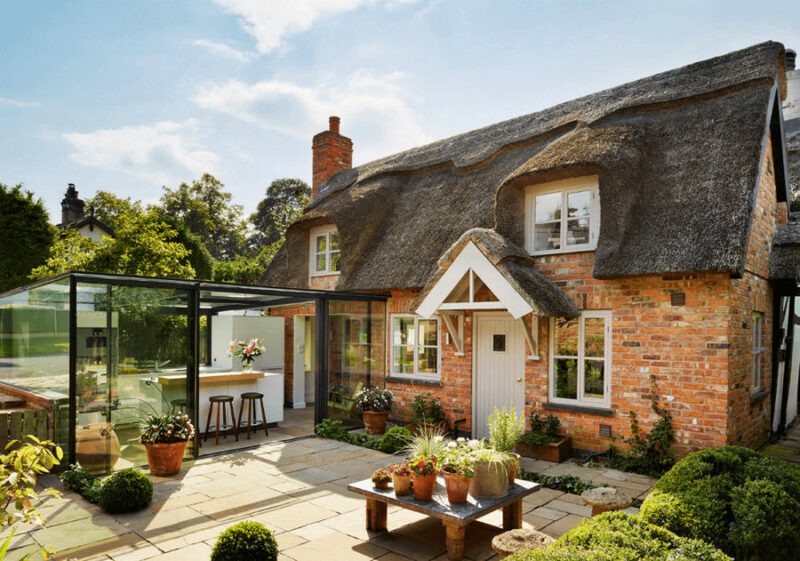 Alex Saint faced a real challenge in the form of an 18th-century thatched-roof cottage, he was commissioned to equip with a contemporary kitchen. It had to be located outside the cottage, you see. 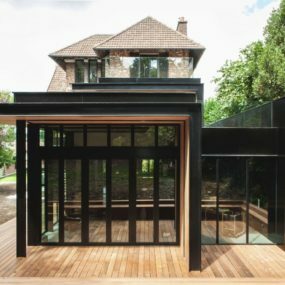 To preserve the integrity of the historic building, he decided to build a simple glass extension that is as airy and independent from the main structure as possible. 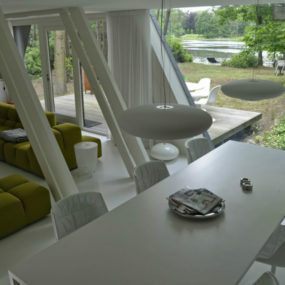 The result is a modern glass room furnished with Bulthaup cabinets and simple round counter stools. 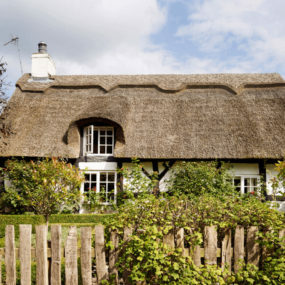 From the front, the cottage looks untouched. It also looks surprisingly fresh and new, as if it was built yesterday. 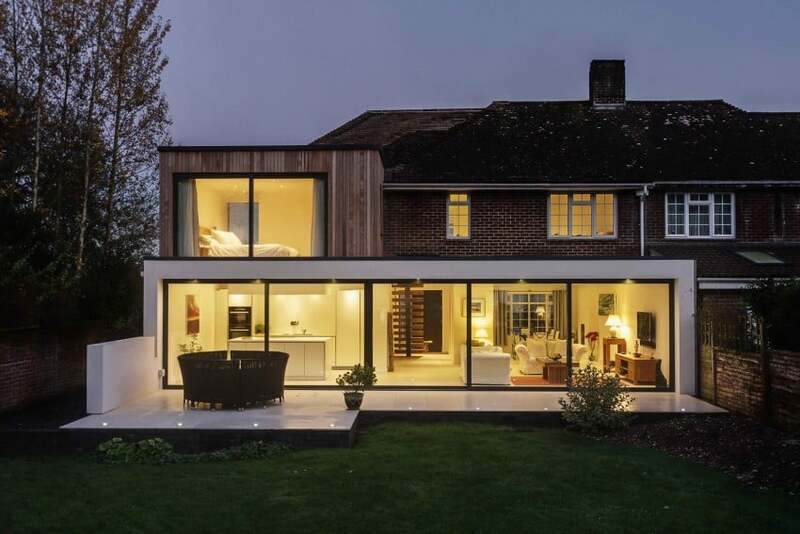 created the extension for an English farmhouse in Crawley, using modern architectural approach. 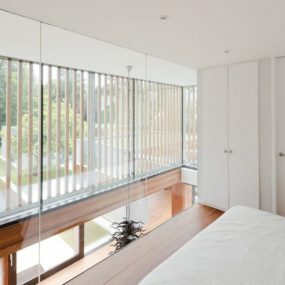 The new blocks are more open to the outdoors and come with sleek contemporary interiors. 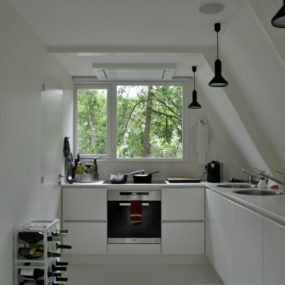 The white block on the ground serves as an open kitchen and a seating area. 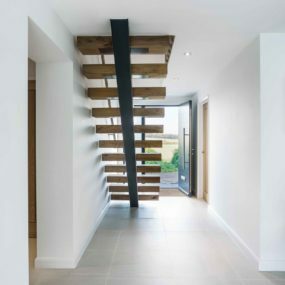 A staircase connects it to the upper wooden block turned into a bedroom. 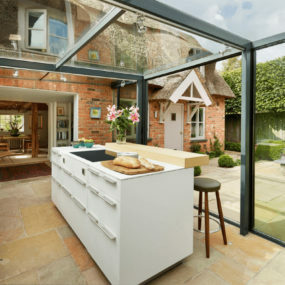 In addition, the lower extension features a built-in patio with a half wall providing little privacy to the area. 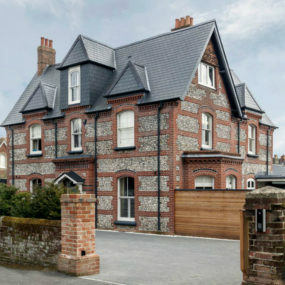 One of the original ‘Winchester Villas’, The Pilot’s House needed not only an extension but also a solid renovation. 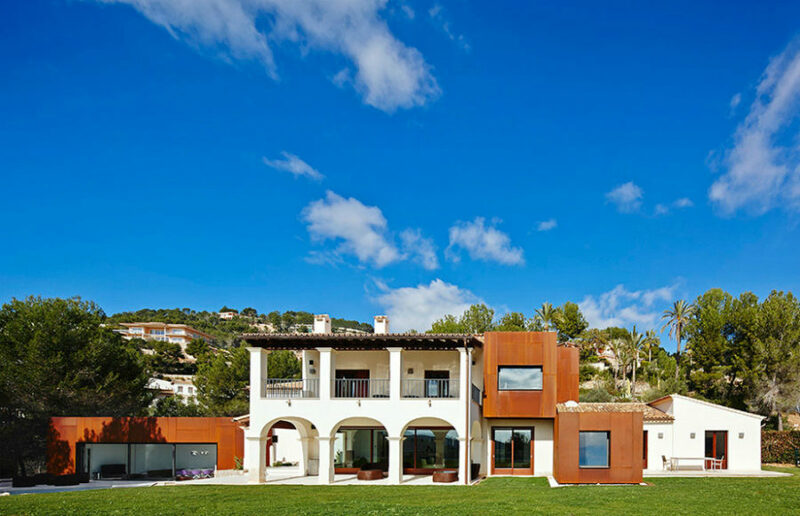 Bought by a family in a state of disrepair, the villa got a 21 century twist from . 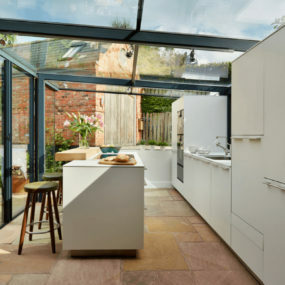 The contemporary extensions aren’t visible from the front, and the villa’s historic appearance shows nothing only the original brick work and flint masonry. 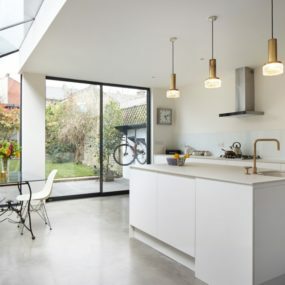 Inside the extensions there is a long indoor lap pool and a big light open kitchen with dining and seating areas. 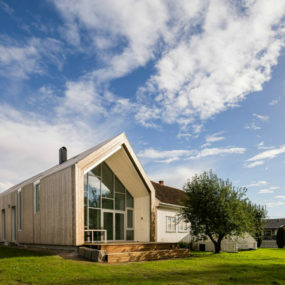 added a contemporary extension to the old farmhouse in Sellebakk, Norway, but made sure it suits it well. 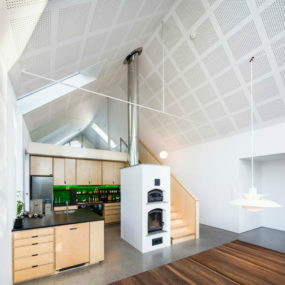 The pitched roof building is long and narrow, and includes kitchen and dining and a living area mezzanine. 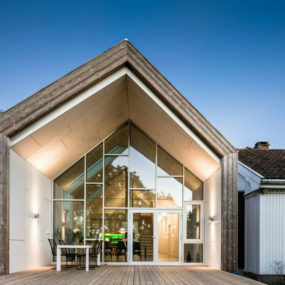 While Kebony cladding gives the extension a somewhat historic look, its glass facade brings it the 21st century flair, not to mention plenty of daylight. 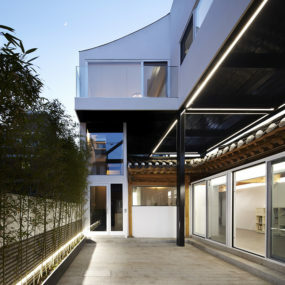 The areas inside are planned within an open layout, and the facade walls extend far enough to create a covered terrace to boot. 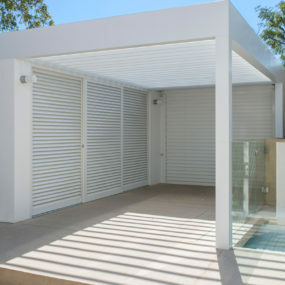 Kubik Extension is the work of GRAS Arquitectos completed in Palma de Mallorca, Spain three years ago. 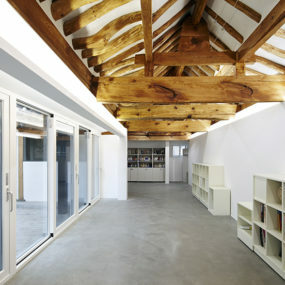 It was decided that a contrasting annex would be fitting for a traditional white Spanish villa. 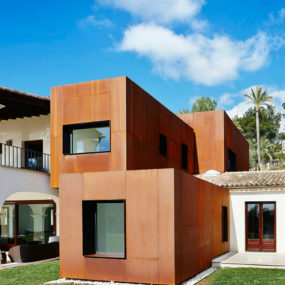 Made in Corten steel the extension blocks look surprisingly fitting indeed. 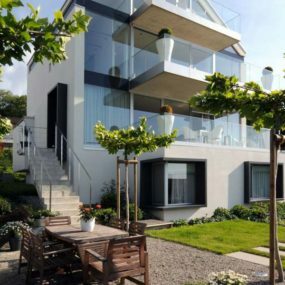 They house a game room, a gym and indoor pool, and several other rooms. 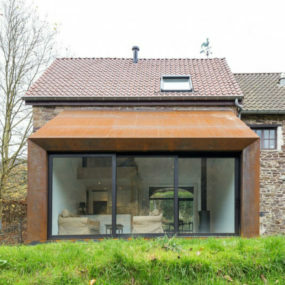 The house’s brown framed windows and doors match the Corten steel well, further gluing the extension to the original structure. 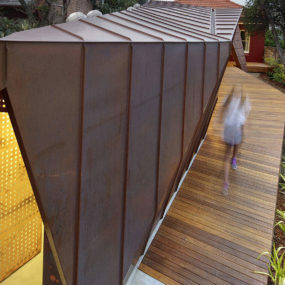 Innovarchi extended a small cottage in Sydney suburb with a triangular metallic addition that houses a kitchen, and creates a privacy hood from the neighbouring house. 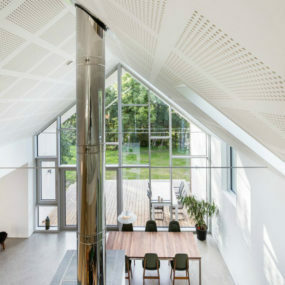 The extension is built with consideration for insulation from both heat and cold. 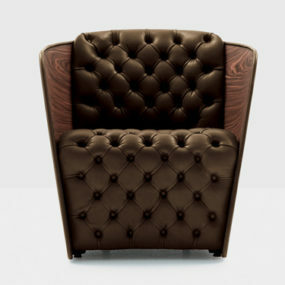 It also adheres to the local requirements and standards, although it’s far from looking standard or traditional. 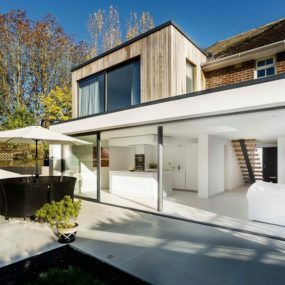 Preserving 95% of the house, the architects also added a wooden path along the angular extension to make the transition from space to space more pleasant. 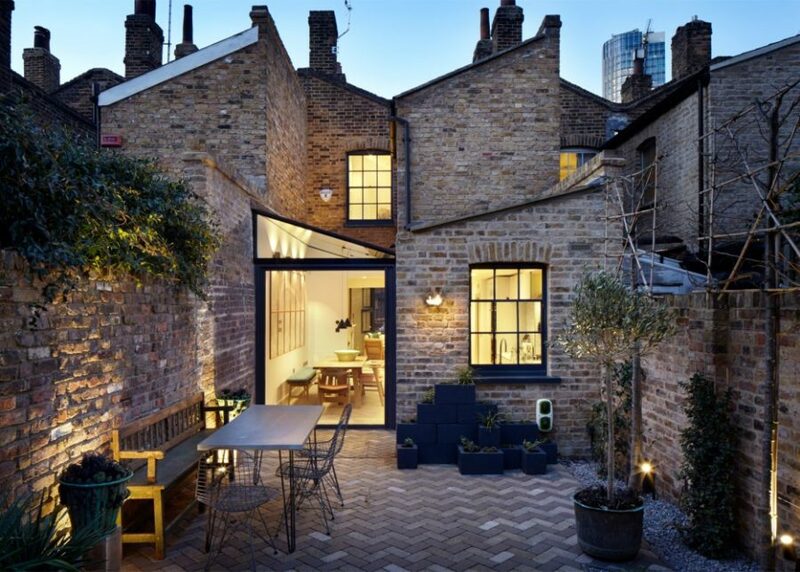 It’s one of the rarer extensions to a non-residential building, but it looks fantastic. 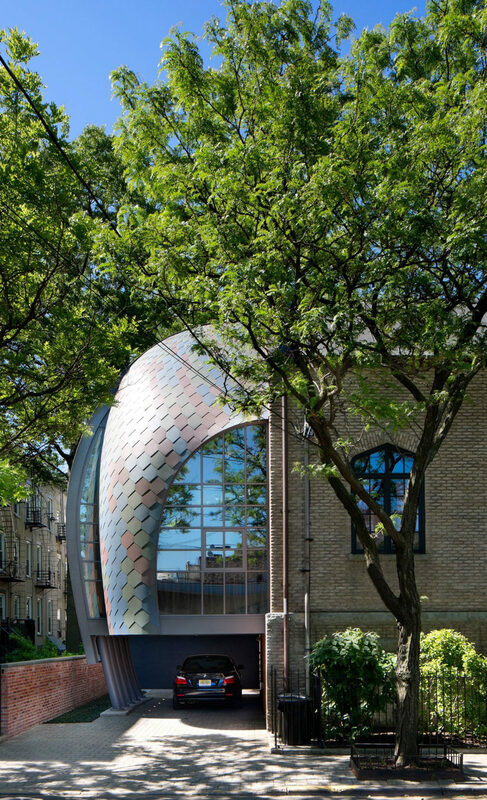 Marchetto Higgins Stieve Architects appended their own studio in New Jersey with a quirky shape, which dictates the interior architecture as well. 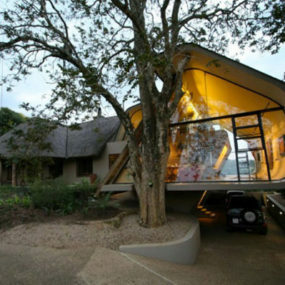 Containing the office, the extension also serves as a carport. 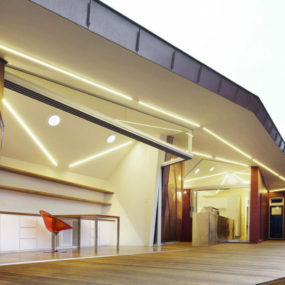 There is an office and a meeting area with a coffee table within the futuristic addition. 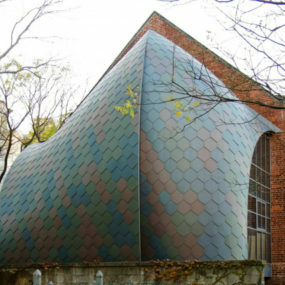 Another intriguing thing about it is its colorful shingles that make it look like some kind of a seashell in concert with the similar organic shape. 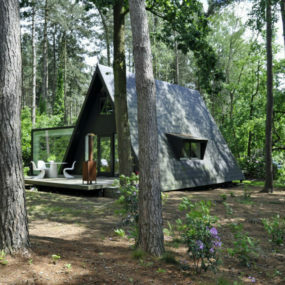 enhanced the vB4 house in Brecht by adding a different geometric shape to its original triangular form. 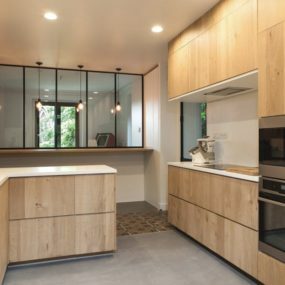 Looking like a small cabin in the woods, the house can now receive guests in a home library/dining room that resulted from the addition. 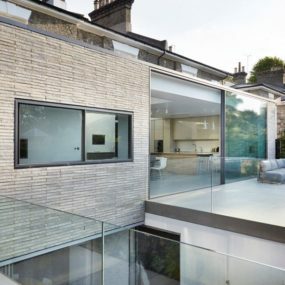 The rectangular extension features wall-sized windows, so that the house can now fully take advantage of the nearby pond views. 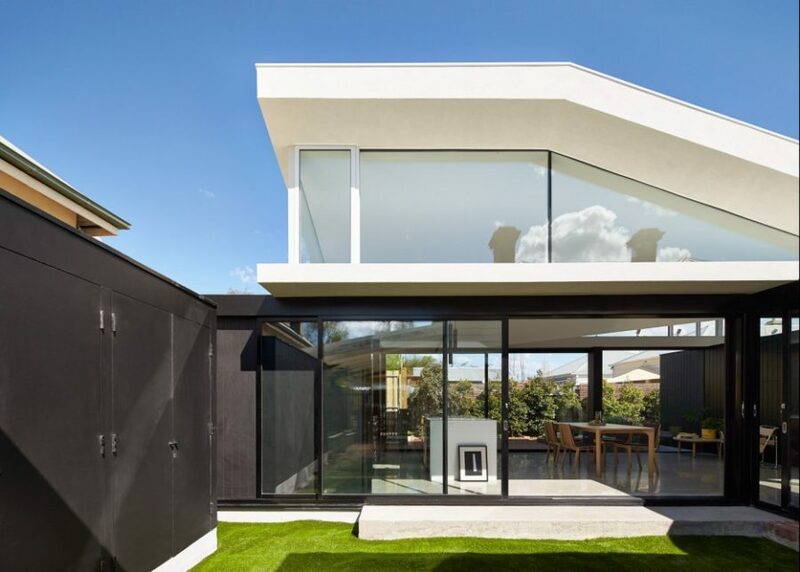 Just like the original building, the black framed addition has a contrasting white interior that’s divided from the main area with angled columns. 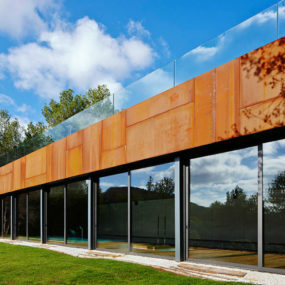 It seems like the glass contemporary extensions work with all types of buildings. 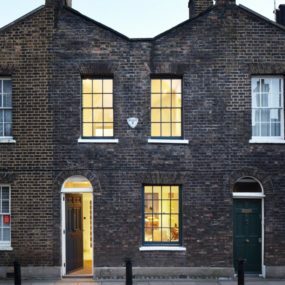 This English brick house, for instance, got some additional space covered with glass windows and walls. 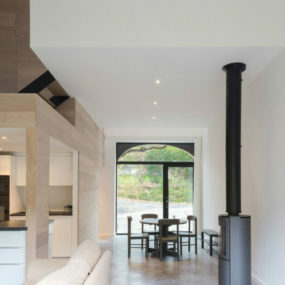 But there is no discord between the original house and extension. 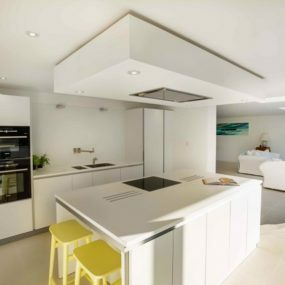 Inside, there is a spacious kitchen and a dining area. 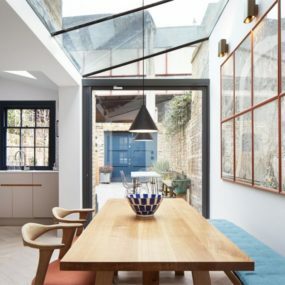 The glass ceiling creates a beautiful atrium in the room. 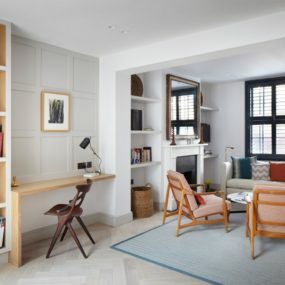 The rest of the space is occupied by storage units, but also connects well with the old house creating a dynamic interior. 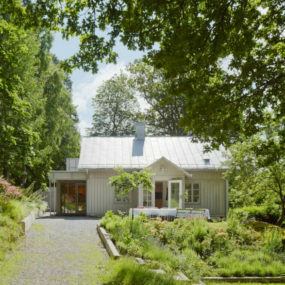 Kod Arkitekter and General Architecture built a contemporary extension for a 19th-century summer villa that corresponds with the style and look of original architecture. 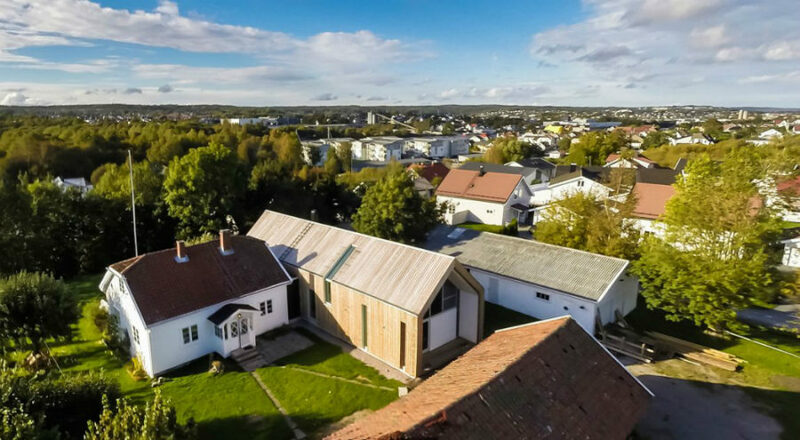 Doubling the space of the villa, the extension has the same grey wooden structure and a similar shape that doesn’t contrast too much with the pitched roof main building. 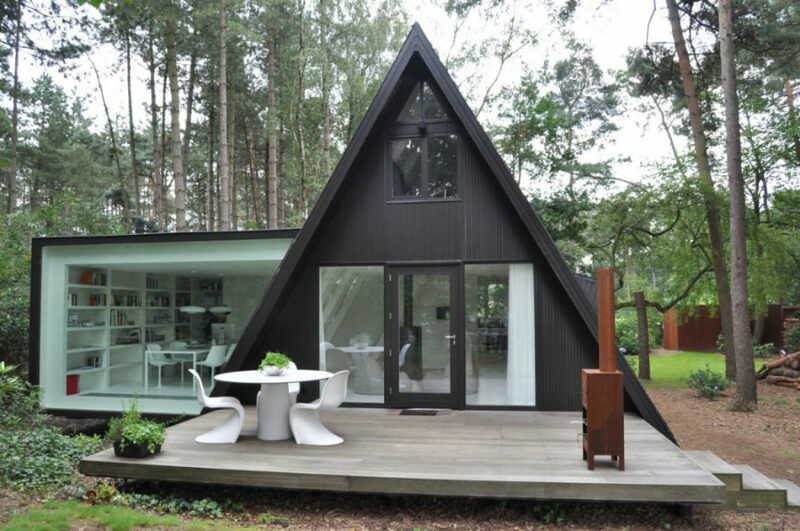 Its wood-clad interior houses various living spaces, and surprisingly enough looks very modernist, circa 1960’s. 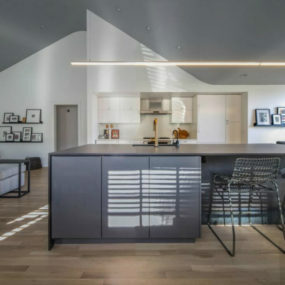 While renovating an old cottage, McGarry-Moon Architects added a little more space to it with a contemporary extension. 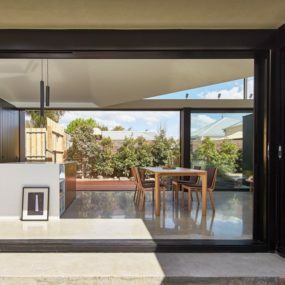 The concrete and timber unit barely stands out against the brick and tile structure. 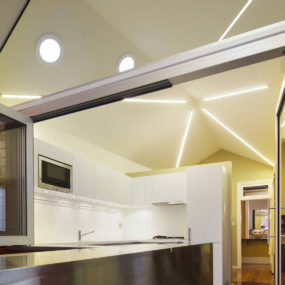 Designed in a contemporary open style, the living unit gets its privacy from a timber louvre system. 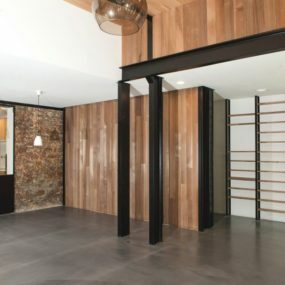 The walls facing the street are entirely clad in wood. 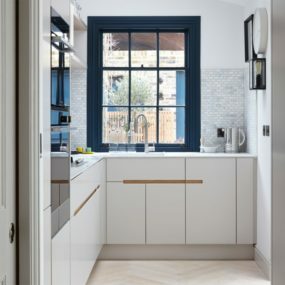 The interiors are gorgeously contemporary with glossy kitchen cabinetry and statement lighting. 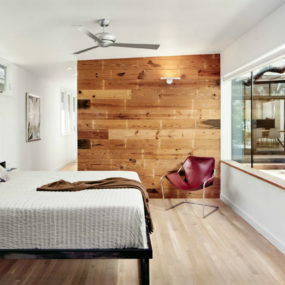 Bedroom walls are also made of glass to take advantage of daylight and louvre system. 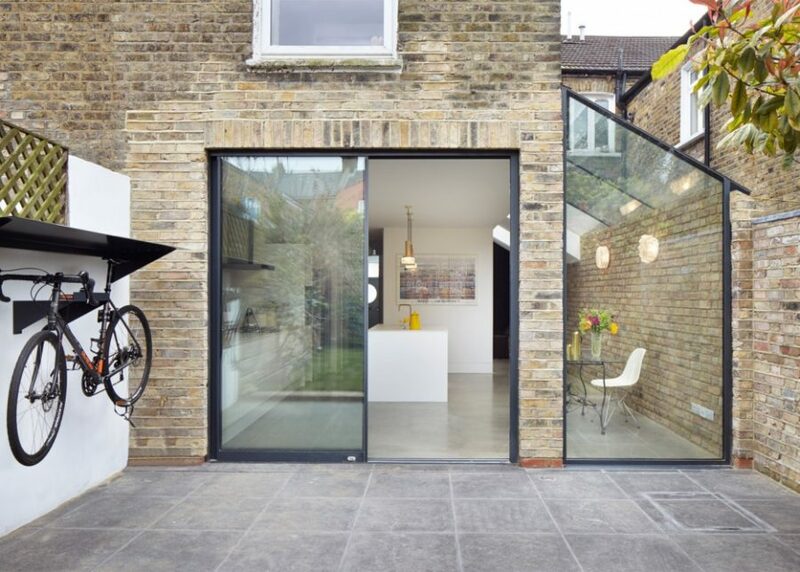 They certainly like extensions in London. 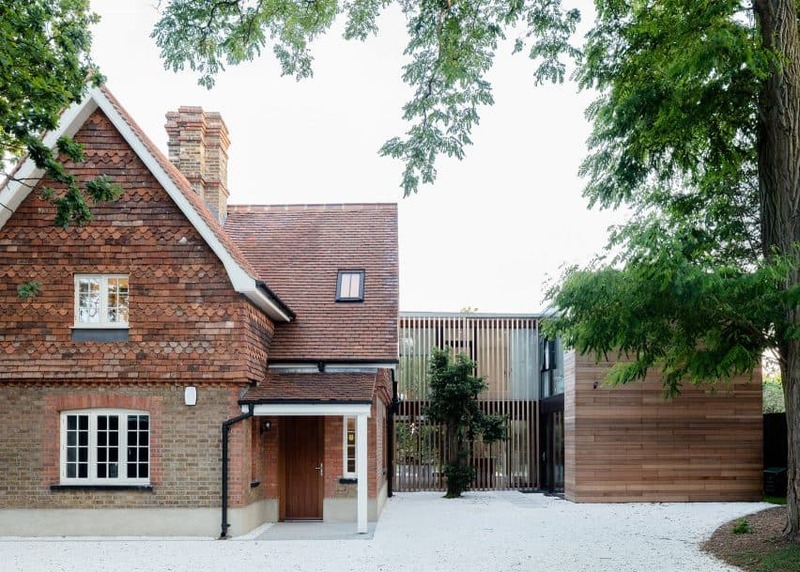 The White Lodge House is one of the older buildings that, too, got a contemporary vibe with an extension made of glass and brick. 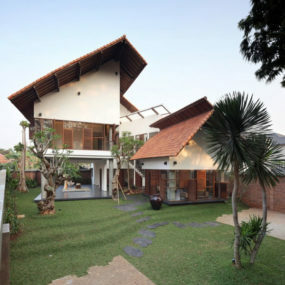 The stylish structure creates an ample outdoor lounging area furnished with a sofa. 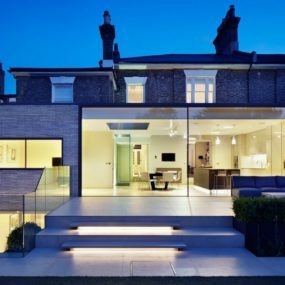 And the glass railing staircase, leading to the rest of the extension, allows plenty of daylight to the lower level rooms. 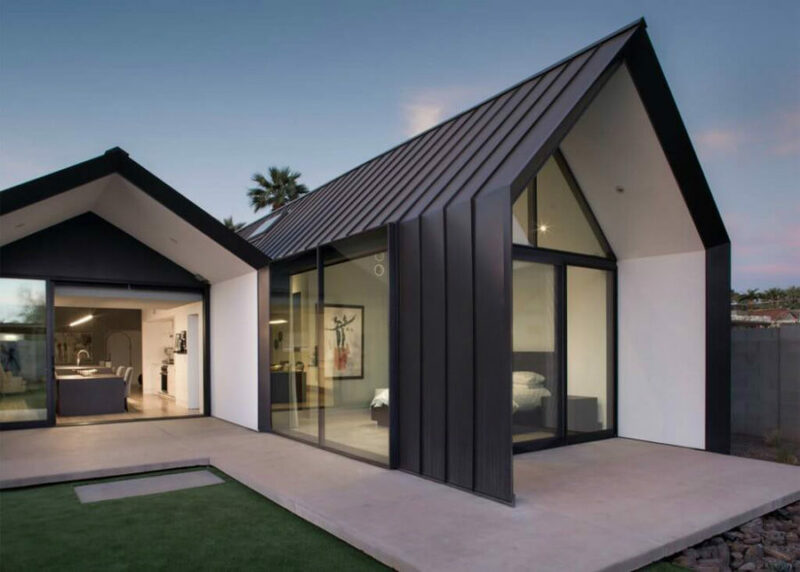 The interior is as sleek as usual, and coordinates well with the addition architecture. 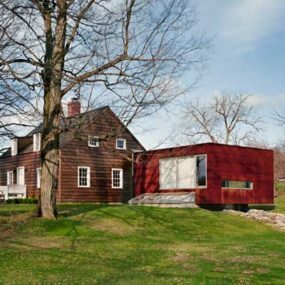 18th-century farmhouse isn’t an easy structure to append. 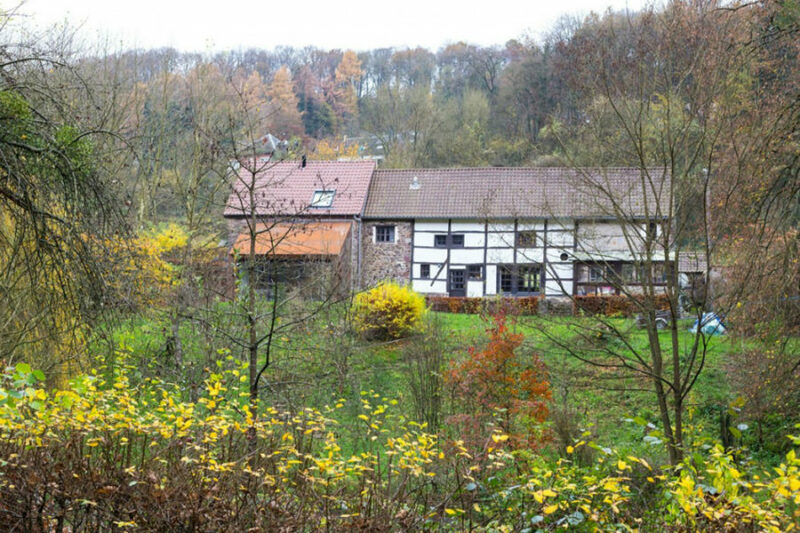 It’s been built in a completely different time, and it’s already a finished building. 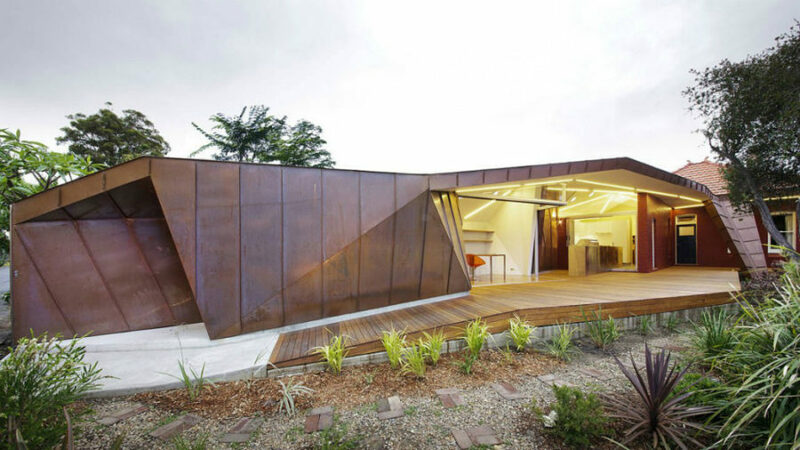 Architects of Puzzle’s Architecture decided to go with Corten steel as it’s so often looks fitting. They managed to marry an extension to the main building quite well. 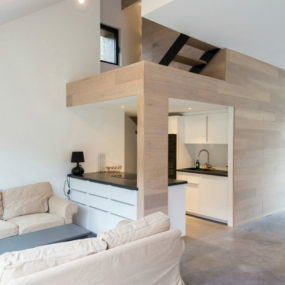 Now there is a kitchen and a dining area connecting with the rest of the house via a staircase. 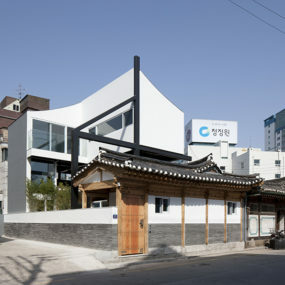 To preserve a part of a dilapidated building, and create something new is another type of challenge. 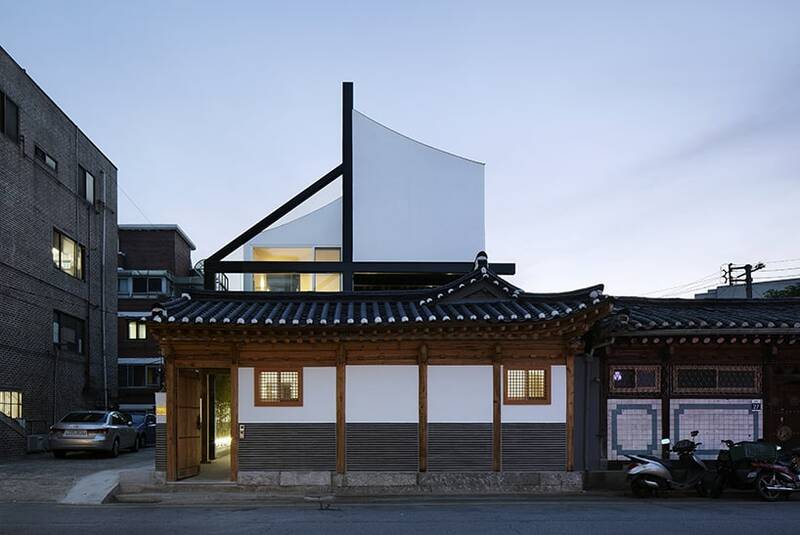 CoRe Architects did well building around the existing hanok in Seoul. It’s hard to imagine how can the two different structures coexist so well, but CoRe managed to do it. 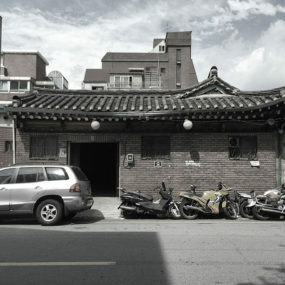 Now the old but reinforced hanok serves as a book cafe. 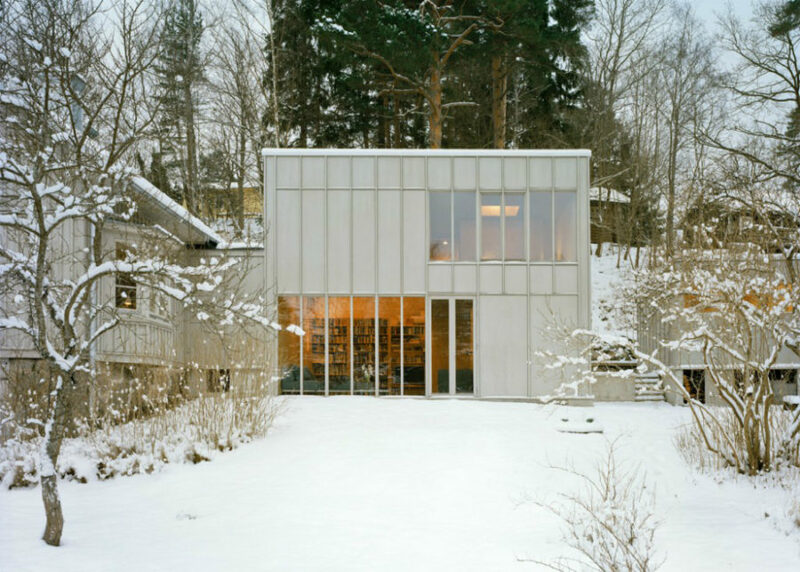 And the contemporary white building gives it a great contemporary context without taking too much attention away. 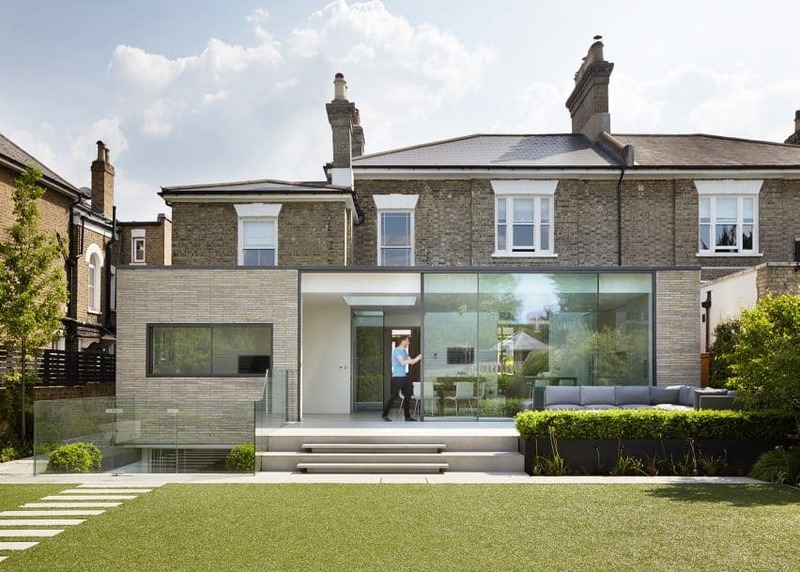 A modern family bungalow got a fitting extension developed by Ian Moore Architects. 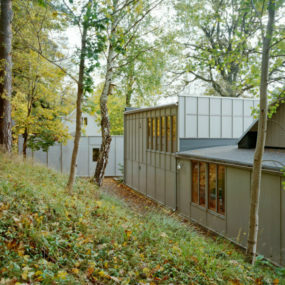 The cube-like shuttered addition serves as a perfect breezy alternative to the wall-heavy main building. 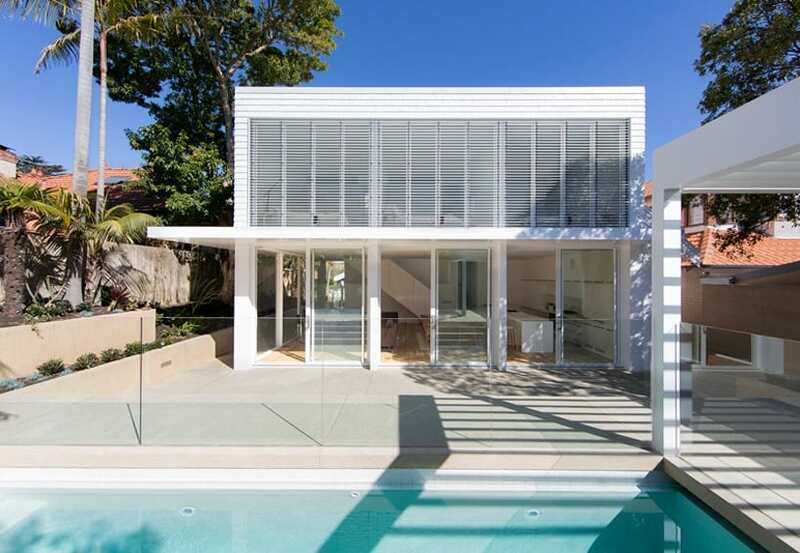 Its white interiors with light wooden floors and wall-sized windows overlook the modern yard with a swimming pool and Australian flora. 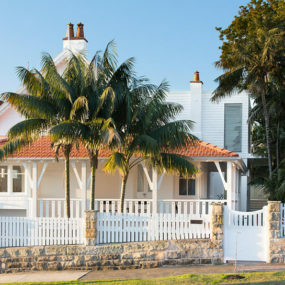 From the side of its facade, the bungalow looks unchanged and quite traditional. It looks like a historic building where they would film a movie about supernatural. 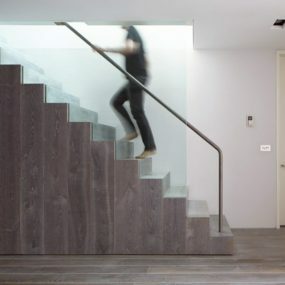 But this Parisian family home has got a contemporary feature that is barely noticeable. 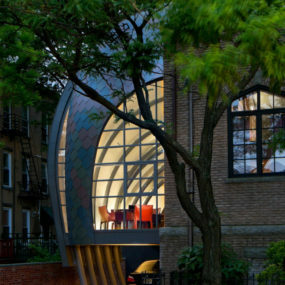 It was constructed with black steel and a lot of glass to make it more similar to the original structure, at least in color. 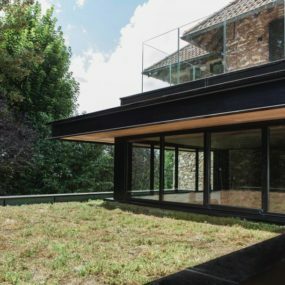 In addition to living space, the extension serves as a roof terrace sown with grass, creating the lawn the house cannot have because of the nature of the site. 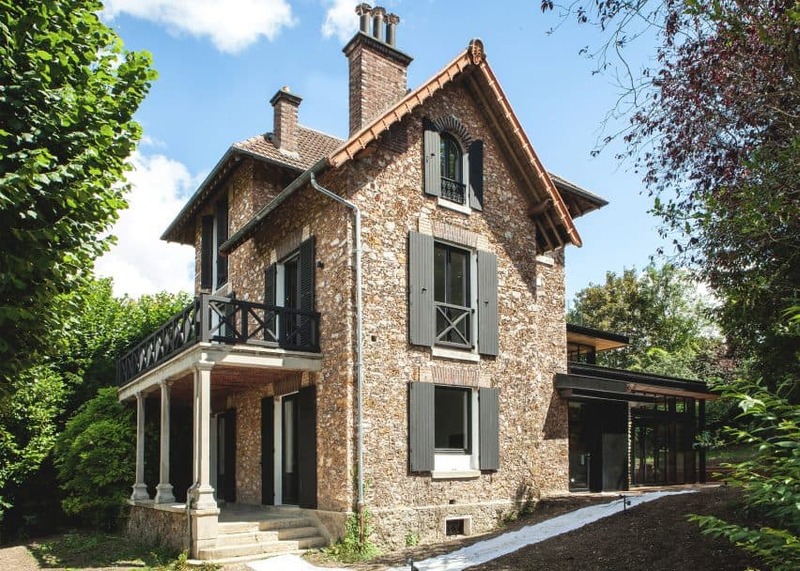 Just like many before, Fraher Architects left the facade of this 19th century house untouched. 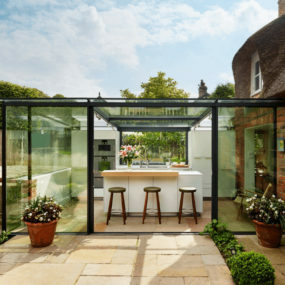 In the backyard, though, they added a bit of glass to create light and bright dining room and kitchen. 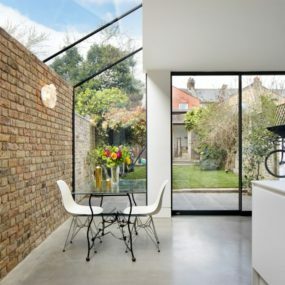 As usual brick agrees very much with the glass, preventing any kind of shocking contrast between the building and extension. 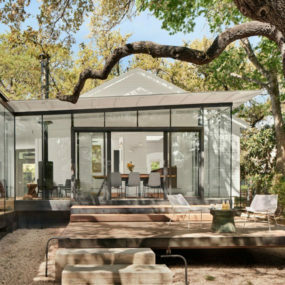 The glass wall also brings more illumination to the small backyard, all the while corresponding with the big window panes of the old house. 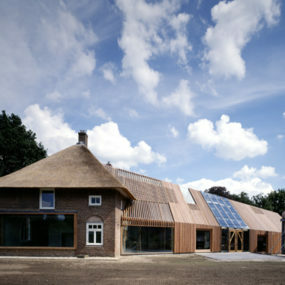 Some extensions are worth distinguishing from the main building. 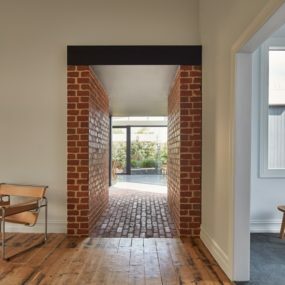 MODO created a brick tunnel that makes a clear separation of the traditional house and contemporary addition. 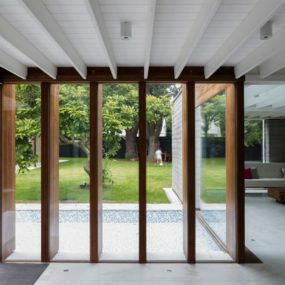 Partially glazed pavilion that houses an open kitchen/dining area also divides the outdoors, creating two zones for lounging – one sown with grass and another one covered with wooden planks. Th perks of contemporary extensions are numerous. 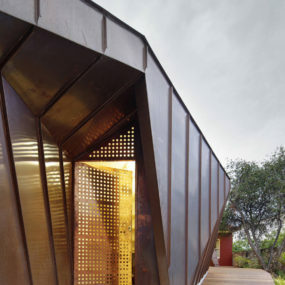 Aside from enhancing your square footage, though, they can also provide you with the architecture you like or the functionality you’ve always wanted like these outdoor home office sheds.